Some of you may have seen this picture during the Pope's recent visit to Philadelphia. It's gotten a lot of 'play' - in fact, it was voted one of the ten iconic kisses in the world in 2015. But what you may not know is the back-story behind this picture. The baby is just not any baby, it's Chrissy Quisenberry's daughter -- a client and friend of ours who is Assistant to the President at Villanova University. Chrissy decided that she wanted to see the Pope in person and so she and her baby went to Center City that day. She was standing rows back from the motorcade procession. While there, she was speaking to her Dad on her cell phone - he was at home watching the Pope on television. He tells her that the Pope is kissing babies. Inspired by that information, she tried to move closer in the hopes that the Pope might kiss her baby -- but there were still rows of people between she and the Pope. A close friend, who was with her that day, discouraged her from trying. 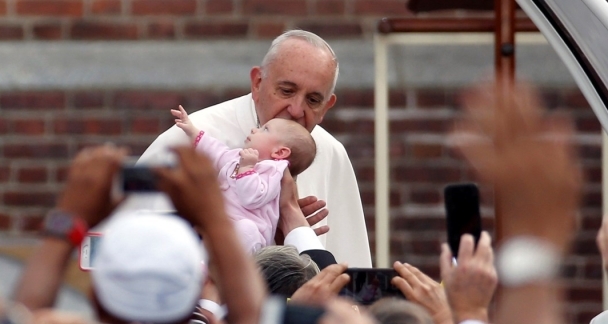 Despite his hesitancy, she lifts her baby up high over people's heads. At that very moment, a security person leans way into the crowd, takes her baby and presents her little girl to the Pope. Amazingly enough, an Associated Press photographer just happened to be in the right place at the right time and snaps this shot. The seemingly impossible happens - and it is caught on film! So how does a miraculous moment like this happen? And more importantly, how to you create miracles like this for yourself? First, you have to put yourself in the game. Being 15 minutes outside of Philadelphia, we considered going to see the Pope, but were scared off by the "record" crowds expected. Chrissy wasn't. She put herself on the playing field and in the game. Miracles happen because we believe they can. Chrissy thought it was possible that the Pope would kiss her baby. If she didn't think it was possible, there would be no moment. When was the last time you had a big idea that both thrilled you and scared you? How do you know when to listen to your own voice when you have other voices that are both encouraging you and discouraging you? At the end of the day, it's important to trust your own voice. Also, when it comes down to it, it's about taking bold action. If that is not in your nature, it's wise to surround yourself with people who think and act big. Chrissy's Dad is a man who has a history of thinking and acting big. Miracles happen when we release our resistance, give up control and allow the cooperative components that surround us to lift us up. Chrissy trusted the people around her and allowed them to help her make this happen. What "miracles" are in store for you this year? What can you imagine for yourself that would be really cool? Be sure to write us and let us know how your miracles have unfolded!